Product prices and availability are accurate as of 2019-04-11 18:02:48 EDT and are subject to change. Any price and availability information displayed on http://www.amazon.com/ at the time of purchase will apply to the purchase of this product. **WE CANNOT SHIP LIVE PLANTS TO THE STATES OF AZ,CA,NV,OR, OR WA, OUTSIDE THE CONTINENTAL USA OR TO APO OR FPO ADDRESSES DUE TO AGRICULTURAL RULES AND RESTRICTIONS Pineapple Mint (mentha suaveolens 'variegata') Fruity scent and flavor. Good tea mint. Attractive trailing variety good in containers and hanging baskets. Features small oval shaped variegated green and white leaves. Easy to grow perennial zones 6-9 THIS PLANT DOES NOT SHIP WELL DURING HOT WEATHER. You will receive One well rooted plants shipped in 3" nursery containers. 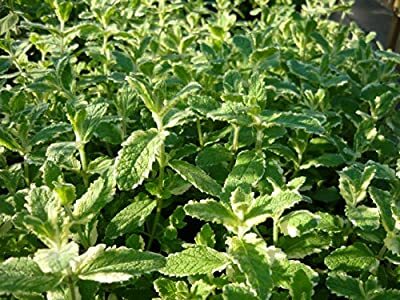 Colonial Creek Farm is a licensed and inspected nursery selling rare and hard to find herb, scented geranium, and salvia plants. Plants are shipped by USPS priority mail on Mon & Tues of each week, (with the exceptions of holidays which may delay shipments up to a week.) We ship year round however, Please keep in mind your zone when ordering plants out of season as we do not use heat packs. The plant you will receive will be well-rooted starter plants shipped in their 3" nursery containers approx. 4" - 6" tall. The plants you receive may or may not be in bloom at time of shipment. Plants may be cut back for shipping purposes. Care instructions are included in each shipment and will greatly improve the success you have with your plants. Please contact us if you have any questions or concerns. We appreciate your business. Thank you!